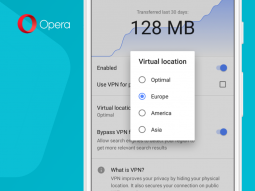 Opera’s bringing back its VPN (virtual private network) service, although in a slightly different format. In 2016, the company launched a free VPN app for Android (followed by an iOS launch) but the app was discontinued last year. If you remember, last time Opera’s service was offered as a standalone app. But this time Opera will offer the free VPN service again as part its Opera browser for Android. So to use the VPN, you have to download the Opera browser itself hence this feature may lead to increased adoption of the Opera browser-something which the standalone app did not guarantee. Once you turn the option on, you can choose your virtual location. Although the choices aren’t as good as you would get from a commercial VPN service, you do get to choose whether you want to be virtually located in Europe, America, Asia or Optimal (for optimal location). However, I’m pretty sure that most users will simply stick with Optimal though, which should automatically select the best server to connect to. The post Opera Brings Back Its Free VPN Service As An In-built Browser Feature appeared first on Techzim.